Your local Clean Rite team is the first choice in carpet cleaning and stain removal. Clean Rite Cleaning have the latest technology and techniques in cleaning all kinds of carpets inside your home, office or commercial building. The use of upholstery furniture is more than any other item in your home or office, and it also needs proper cleaning as other items in the house or office needs. As it is used extensively, dirt, dust and stains can easily be found on your upholstered furnishings which will make the appearance of your upholstery old and tired. No matter what material your upholstery has, it will need cleaning which should be done by a professional. You cannot run a wet cloth on your leather sofa or use detergent to remove stains. Upholstery cleaning is important for the lifespan of your furniture. It is recommended to get your upholstery cleaned by a professional once or twice a year which will keep your furniture both hygienic and clean like new. A flooded house can have extensive and long-lasting damage. Quick action can mean saving a property from permanent damage, sewage back flow or mould. With the right equipment and the team behind it, you can be assured that the property will be restored to a healthy and safe standard again..
We love our pets. They are great companions and it’s nice when all the family plays with them. Dogs, in particular, are special animals. Somebody says a dog is a man’s best friend. Is that true? Who knows. Sometimes though our dear pets can forget where the toilet is and our carpets or other pieces of furniture need to be cleaned professionally. 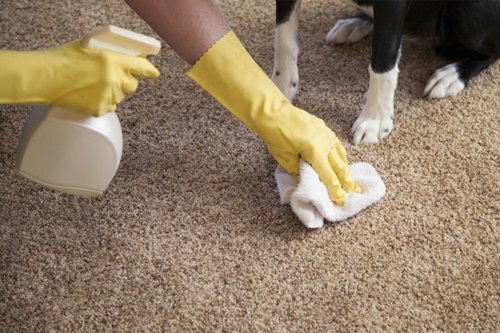 Clean Rite Carpet Cleaning offers a professional pet urine and odour removal service. In New Zealand many homeowners have pets and know that, even if they love them very much, they cannot allow them to ruin the hygiene of the house. Clean Rite Carpet Cleaning provides a quick and effective pet urine and odour removal service in Hamilton. Give our friendly team at Clean Rite Carpet Cleaning a call on 0800101216 for a free quote.